Niagara-on-the-Lake is the centre of wine country. The Niagara River runs northerly for about 58 km (36 mi) between Lake Erie and Lake Ontario. The steelhead fishing is great, as long as you don't get too close to the waterfall, where four to six million cubic feet of water per minute plunges straight down for 57 m (188 ft). Niagara-on-the-Lake is a popular tourist town about one hour west of Toronto, where the Niagara River meets Lake Ontario. The place has an interesting history. American forces burnt the town to the ground in 1813. In retaliation, British and "Upper Canada" (as Ontario was called back then) forces caused a little of their own destruction on the US side. In 2012, this town will be the place to be for history buffs as the bicentennial of the War of 1812 is celebrated. The Château des Charmes winery is a jewel of the Niagara countryside. Niagara-on-the-Lake is in the heart of wine country. There are dozens of wineries within ten minutes of town. You can easily get to them by car but many travelers tour them on bicycles. Several of the wineries are found on back roads with little traffic, or along the Niagara Trail, a 56 km paved cycling route that hugs the Niagara Parkway. I think it was Winston Churchill who once called it "the prettiest Sunday drive in the world". The Shaw Festival Theatre, which is devoted to George Bernard Shaw and his contemporaries is also in Niagara-on-the-Lake, and so are some wonderful inns where you can dine or overnight. This is a great area in which to experience both the pastoral country life of rolling vineyards and the high culture of award-winning restaurants and celebrated chefs. There are also plenty of historic inns. We stopped at one, the Riverbend Inn on the Niagara Parkway. Lots of people were out on its patio enjoying a glass of vino while gazing out over the vineyard. This establishment takes advantage of the Niagara microclimate and harvests its own signature wine from its own vineyards. The chef has a “Secret Garden” here too, an impressive affair that front desk staff told me is their main source of produce during the summer months. 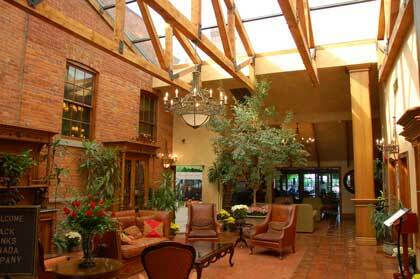 For inns and resorts around Niagara-on-the-Lake, check out the Niagara Falls region on the Resorts of Ontario website.